I made a this diaper clutch for a baby shower recently, to go along with the applique onesies. It’s so perfect for diapers and wipes…but it’s also a great size for anything! I think it’s the perfect date night clutch. I have a little left over so you might be seeing a little more chevron around here in the near future. When choosing your fabric, just make sure you pick a home decor weight fabric to make it a little extra sturdy! The brown one is my favorite! Since my original intention for this clutch was for a baby gift, I made it the perfect size to hold a soft pack of wipes and about 3 diapers. You could probably stuff more in there if you wanted to. These are size 3 diapers for comparison. 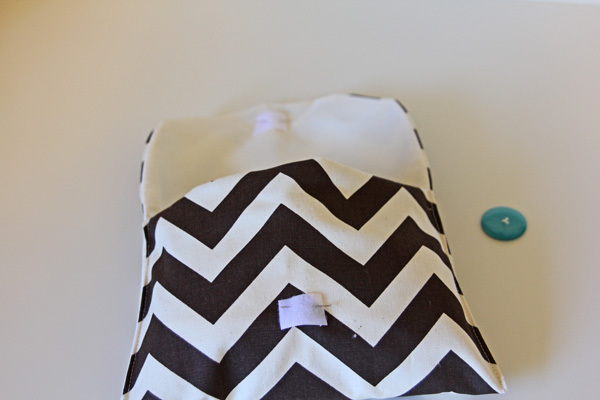 But this clutch is so cute, it is totally not limited to just diapers! button, the bigger the better! First, print out the pattern piece. The pattern is just for the top flap. I didn’t want to waste paper when the rest of the clutch is made with straight edges! So, what you’ll do is lay the pattern on your fabric. The finished clutch piece will be 11″ wide and extend an extra 14.5″ from the pattern piece. Got that? Your finished piece will be 14.5″ PLUS the flap pattern by 11″ wide. Cut out 1 of heavy weight cotton and 2 of quilting weight cotton. You can use muslin, a solid or a print for the lining. Having two layers will just make it nice and soft. Stack the two layers of cotton on top of the chevron fabric with right sides together. Pin all the way around. Then sew all the way around, leaving a 3-4″ opening on one of the SIDES. Make sure it is on the lower part of the clutch so it will close up when you sew the sides together later. Trim all the way around and clip the rounded edges. Turn it right side out and press. The little arrow shows what your opening should look like. Fold up the bottom part of the clutch, 6.5″ and pin in place. Now sew up the sides at 1/4″, making sure to backstitch at each end. The sides will look so good. Check it out. This is my favorite way to do a bag seam, it just looks so awesome! Now all that is left is the velcro and the button. I like to fill up my clutch to help me decide where to put the velcro. You can just sorta eye it based on the picture below, if you want. Sew on the velcro and then sew on the button. You are clutched! sugarplum peplum top + dress PDF pattern release! The Polka Dot Color-Pop Industrialized Jumper. silkscreened fabric simple great giveaway! You are so cute and the stuff you make is even cuter! I love it! I love this. The Chevron print is great. I see a Christmas gift! New follower here! So glad I found you on Follow Fest! Your blog is lovely and I LOVE all the tutorials!! You and your clutch are just adorable! I envy your ability to sew…what an incredible talent you have. I found you through Followers Fest…hope you’ll stop by and say hi! That is so cute, I think I could maybe do that. I’ll give it a try. visiting from the followers fest. Completely adorable and great tutorial! this is the perfect amount of chevron pattern for my taste! visiting form TT&J! I’ve Pinning this for sure! gosh, i LOVE this, like a lot!! chevron is my fave pattern right now!!! this is great, i’m a guy from the UK who has recently bought a sewing machine and am looking to make some projects like this. Can you suggest a ‘manly’ project other than a messenger bag? 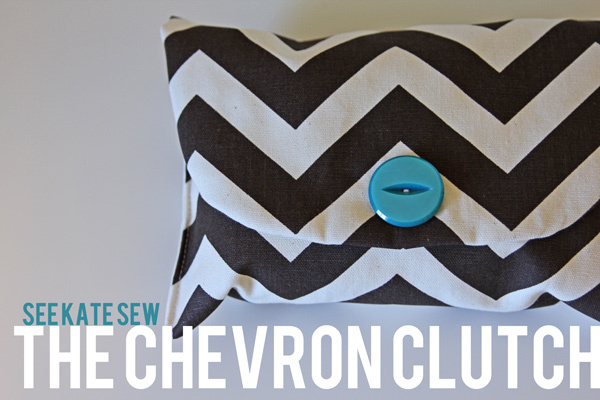 Chevron is thee ‘IT’ print right now…love this. I’m going to try it. Thanks! This is a great tutorial, and I can’t wait to try it myself. I posted a link to it on my blog’s ode to everything chevron today. Hi. This tutorial is amazing – it has very clear pictures and instructions. I have linked you on my blog: http://mel-allwrappedup.blogspot.com.au/p/link-love-to-amazing-free-craft.html. Super cute. I love it. I can’t wait to try and create this. I got some cute chevron fabric from Hobby Lobby that is grey/cream and it will be adorable as a clutch! Thanks for the tutorial. I did it!! I made it! My second sewing project ever! Thank you sooo much! I’ll post pics up on my blog soon. I think I have finally found my hobby, SEWING! Thank you! Hello! Is there any other way to get the pattern piece? I am having trouble accessing it without being a paying Scribd.com member. Thanks! Hello! Is there any other way to obtain the pattern piece? I am having a hard time getting it without being a Scribd.com member. Thanks! I am wondering the same thing as Peg! I’d like to print off the pattern piece, but it’s trying to make me pay for a membership. Is there a way around this? I’m teaching a friend to sew and I think this clutch would be an awesome thing for her to start with! I need the pattern piece also! I love this!